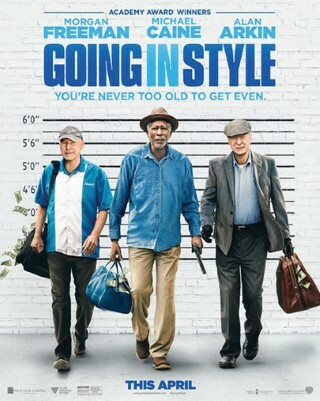 This is a reboot of the 1979 movie that was directed by Martin Brest and featured George Burns, Art Carney, and Lee Strasberg. Here, three different iconic actors take us down a similar path as the original movie - as a reminder that growing old can drive someone to do the unthinkable. These seniors, who are living on social security and are about to also lose their pensions, are reduced to a frazzle and ultimately decide they have had enough. What starts out as just an idea soon comes to fruition in the form of a bank robbery. Despite a film cast that includes three Oscar winners: Morgan Freeman, Alan Arkin, and Sir Michael Caine, as well as two Oscar nominees, Matt Dillon and Ann-Margret, I could not get past the feeling of de-je-vu. I did see the original 1979 version and my impression now is pretty much the same as it was then. While this version does have its humorous moments and its serious side, for me it fell flat on too many other levels. I hate when a remake is made and the biggest difference is the cast. The casting of Matt Dillon as an FBI agent assigned to solve the bank robbery caper, appeared short-sighted, leaving lines that were delivered with no real impact. Edward Cannon, who wrote the 1979 original version, teamed up with writer Theodore Melfi, producer of 2016s “Hidden Figures.” Somehow I didn’t feel they were on the same page. Director Zach Braff (2016s “Dubious Battle”) did not offer up any real differences to the original script. Ann-Margret, who plays Arkin’s eventual love interest, I suppose was intended to add that touch of sexual attraction she is so well known for. While it was convincing, it seemed a bit too much at times and over the edge. On a positive note, Christopher Lloyd was his usual crazy “Taxi” / “Back from the Future” self. His role added most of the humor, leaving the others in his wake. Cast member Siobhan Fallon Hogan also added an extra touch of unexpected humor. Hogan is known for her recurring role on “Seinfeld” and more recently on the TV series, “MacGyver”. While I did stay to see the entire film and did not fall asleep at any given time, I was expecting to see something that would leave these thoughts much further from my mind.